Iowa Sen. Chuck Grassley and South Carolina Sen. Lindsey Graham released an email by Susan Rice to Susan Rice that seemed odd in both its timing and content. After a section that remains classified Rice wrote that Obama discussed sharing the information with the incoming Trump administration. One could almost see Ms. Rice doing an exaggerated wink while sending this email. Why would she write an email about the Jan. 5th meeting on Jan 20th, on Inauguration Day, during her last moments as a federal employee? 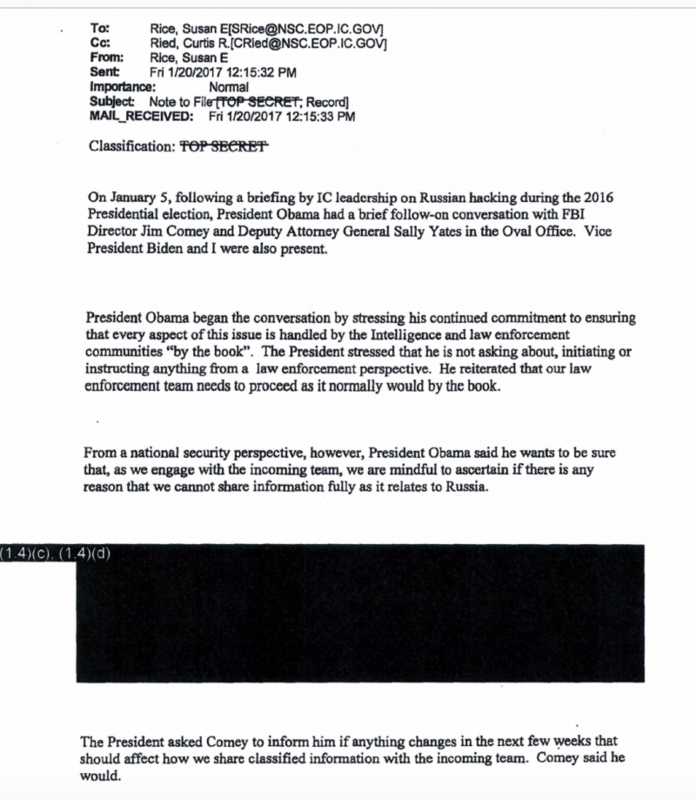 Why the emphasis on “by the book?” To quote Hamlet, “The lady doth protest too much.” Why was Obama was concerned that there might be reasons why certain classified information would need to be withheld from Team Trump? It seems as if she is trying to rewrite history and that maybe something happened during those 15 days that moved Rice to write that email to herself. Did you send the email attached to this letter to yourself? Do you have any reason to dispute the timestamp of the email? When did you first become aware of the FBI’s investigation into allegations of collusion between Mr. Trump’s associates and Russia? Did anyone instruct, request, suggest, or imply that you should send yourself the aforementioned Inauguration Day email memorializing President Obama’s meeting with Mr. Comey about the Trump/Russia investigation? If so, who and why? Is the account of the January 5, 2017 meeting presented in your email accurate? Did you omit any other portions of the conversation? Other than that email, did you document the January 5, 2017 meeting in any way, such as contemporaneous notes or a formal memo? To the best of your knowledge, did anyone else at that meeting take notes or otherwise memorialize the meeting? When and how did you first become aware of the allegations made by Christopher Steele? You wrote that President Obama stressed that he was “not asking about, initiating or instructing anything from a law enforcement perspective.” Did President Obama ask about, initiate, or instruct anything from any other perspective relating to the FBI’s investigation? Did President Obama have any other meetings with Mr. Comey, Ms. Yates, or other government officials about the FBI’s investigation of allegations of collusion between Trump associates and Russia? If so, when did these occur, who participated, and what was discussed? Everything about the Russia investigation as it relates to the Obama administration seems strange and seems to be getting stranger every day. Perhaps there was nothing nefarious about Rice sending an email to herself to get into the national record that everything was done “by the book,” On the other hand, it seems as if she is trying to rewrite history and perhaps something happened during those 15 days that moved Rice to write that email to herself. Like so much else about the Obama administration’s handling of the Russia investigation it sure smells rotten. The Graham, Grassley letter demands an answer by Feb. 22nd. It will be interesting to see what (or if) she answers. And if she answers will it be truthful. Remember Ms. Rice went on five Sunday news shows to lie about Benghazi was incited by a YouTube video.